Environments around the world are changing rapidly because of human activities. We investigate how organisms respond to these changes, and the consequences that the responses have for ecosystems. We have two main lines of research: one that focusses on current responses of organisms to environmental change and another that focusses on past responses. To predict the future, we need to know the past. A) Projects on currents responses concentrate on behavioural responses of animals. This is because behavioural responses often represent the first response to changing conditions. We investigate whether the responses facilitate or hamper adaptation to rapid environmental changes and, further, the consequences that the responses thereby have for the viability of populations. 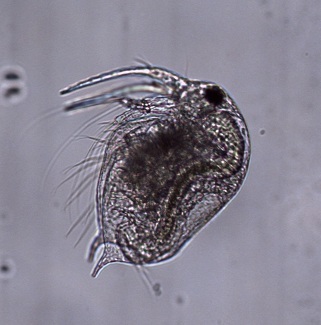 B) Projects on past responses use the information hidden in the sediments of aquatic systems to determine how past zooplankton populations have responded to environmental changes. We collect resting eggs and subfossils from dated layers of sediments, and use resurrection ecology, paleolimnology and paleogenomics to investigate past phenotypic and genetic changes in populations across time. We relate the changes to documented environmental changes. With the work, we hope to increase our knowledge of how organisms respond to altered conditions and, further, the consequences that the responses will have for biodiversity and ecosystem processes in rapidly changing environments.